1 A None No Power Seat 1 A is a standard Business Class bulkhead seat, although close proximity to the galley may be bothersome. 1 C None No Power Seat 1 C is a standard Business Class bulkhead seat, although close proximity to the galley may be bothersome. 1 D None No Power Seat 1 D is a standard Business Class bulkhead seat, although close proximity to the galley may be bothersome. 1 G None No Power Seat 1 G is a standard Business Class bulkhead seat, although close proximity to the galley may be bothersome. 1 H None No Power Seat 1 H is a standard Business Class bulkhead seat, although close proximity to the galley may be bothersome. 1 K None No Power Seat 1 K is a standard Business Class bulkhead seat, although close proximity to the galley may be bothersome. 12 A None No Power Seat 12 A may have restricted legroom due to the bulkhead position. The tray table is in the armrest, making the armrest immovable and slightly reducing seat width. 12 C None No Power Seat 12 C may have restricted legroom due to the bulkhead position. The tray table is in the armrest, making the armrest immovable and slightly reducing seat width. 12 H None No Power Seat 12 H may have restricted legroom due to the bulkhead position. The tray table is in the armrest, making the armrest immovable and slightly reducing seat width. 12 K None No Power Seat 12 K may have restricted legroom due to the bulkhead position. The tray table is in the armrest, making the armrest immovable and slightly reducing seat width. 13 D None No Power Seat 13 D may have some extra legroom due to the bulkhead. This seat has the tray table located in the armrest making the armrest immovable and slightly reducing seat width. 13 E None No Power Seat 13 E may have some extra legroom due to the bulkhead. This seat has the tray table located in the armrest making the armrest immovable and slightly reducing seat width. 13 F None No Power Seat 13 F may have some extra legroom due to the bulkhead. This seat has the tray table located in the armrest making the armrest immovable and slightly reducing seat width. 13 G None No Power Seat 13 G may have some extra legroom due to the bulkhead. This seat has the tray table located in the armrest making the armrest immovable and slightly reducing seat width. 13 K None No Power Seat 13 K is a standard Economy seat. 22 A None No Power Seat 22 A is a standard Economy seat, although proximity to the lavatory and galley may be bothersome. 22 C None No Power Seat 22 C is a standard Economy seat, although proximity to the lavatory and galley may be bothersome. 22 D None No Power Seat 22 D is a standard Economy seat, although proximity to the lavatory and galley may be bothersome. 22 E None No Power Seat 22 E is a standard Economy seat, although proximity to the lavatory and galley may be bothersome. 22 F None No Power Seat 22 F is a standard Economy seat, although proximity to the lavatory and galley may be bothersome. 22 G None No Power Seat 22 G is a standard Economy seat, although proximity to the lavatory and galley may be bothersome. 22 H None No Power Seat 22 H is a standard Economy seat, although proximity to the lavatory and galley may be bothersome. 22 K None No Power Seat 22 K is a standard Economy seat, although proximity to the lavatory and galley may be bothersome. 23 A None No Power Seat 23 A has extra legroom due to the exit row, however the exit door protrudes into the legroom so you may have to angle your legs. There is no floor storage during take-off and landing.Proximity to the lavatory and galley may be bothersome. 23 C None No Power Seat 23 C has extra legroom due to the exit row, although close proximity to the lavatory and galley may be bothersome as passengers often congregate here. There is no floor storage during take-off and landing. 23 D None No Power Seat 23 D has extra legroom due to the exit row, although close proximity to the lavatory and galley may be bothersome as passengers often congregate here. There is no floor storage during take-off and landing. 23 E None No Power Seat 23 E has extra legroom due to the exit row, although close proximity to the lavatory and galley may be bothersome as passengers often congregate here. There is no floor storage during take-off and landing. 23 F None No Power Seat 23 F has extra legroom due to the exit row, although close proximity to the lavatory and galley may be bothersome as passengers often congregate here. There is no floor storage during take-off and landing. 23 G None No Power Seat 23 G has extra legroom due to the exit row, although close proximity to the lavatory and galley may be bothersome as passengers often congregate here. There is no floor storage during take-off and landing. 23 H None No Power Seat 23 H has extra legroom due to the exit row, although close proximity to the lavatory and galley may be bothersome as passengers often congregate here. There is no floor storage during take-off and landing. 23 K None No Power Seat 23 K has extra legroom due to the exit row, however the exit door protrudes into the legroom so you may have to angle your legs. There is no floor storage during take-off and landing.Proximity to the lavatory and galley may be bothersome. 34 A None No Power Seat 34 A is in the last row of Economy and may have limited recline. Proximity to the lavatory and galley may be bothersome. 34 C None No Power Seat 34 C is in the last row of Economy and may have limited recline. Proximity to the lavatory and galley may be bothersome. 34 D None No Power Seat 34 D is in the last row of Economy and may have limited recline. Proximity to the lavatory and galley may be bothersome. 34 E None No Power Seat 34 E is in the last row of Economy and may have limited recline. Proximity to the lavatory and galley may be bothersome. 34 F None No Power Seat 34 F is in the last row of Economy and may have limited recline. Proximity to the lavatory and galley may be bothersome. 34 G None No Power Seat 34 G is in the last row of Economy and may have limited recline. Proximity to the lavatory and galley may be bothersome. 34 H None No Power Seat 34 H is in the last row of Economy and may have limited recline. Proximity to the lavatory and galley may be bothersome. 34 K None No Power Seat 34 K is in the last row of Economy and may have limited recline. Proximity to the lavatory and galley may be bothersome. 4 D None No Power Seat 4 D is a standard Business Class seat, although proximity to the lavatory and galley may be bothersome. 4 G None No Power Seat 4 G is a standard Business Class seat, although proximity to the lavatory and galley may be bothersome. 5 A None No Power Seat 5 A is missing a window. The proximity to the lavatory and galley may be bothersome. 5 C None No Power Seat 5 C is a standard Business bulkhead seat, however proximity to the lavatory and galley may be bothersome. 5 D None No Power Seat 5 D is a standard Business bulkhead seat, however proximity to the lavatory and galley may be bothersome. 5 G None No Power Seat 5 G is a standard Business bulkhead seat, however proximity to the lavatory and galley may be bothersome. 5 H None No Power Seat 5 H is a standard Business bulkhead seat, however proximity to the lavatory and galley may be bothersome. 5 K None No Power Seat 5 K is missing a window. The proximity to the lavatory and galley may be bothersome. A Universal PC Power port, iPod connector, and USB port is located at every seat on this aircraft. As ANA’s newest aircraft, the Boeing 787-8 Dreamliner is outfitted with 222 seats and will be used for flights from Tokyo, Narita to Hong Kong. The 787-8 configurations will feature LED lighting throughout the aircraft, windows about 1.3 times bigger than conventional airplanes, an economy class bar, larger overhead bins, and TOTO washlets in each lavatory which provides users with a warm-water bidet function. Seats in economy class do not recline but instead have a hard shell back. Instead of reclining, the bottom portion of the seat slides forward by 3 inches. This decreases seat pitch as knees come closer to the seat back; however personal space is preserved as the seat ahead does not recline. NRT to KUL on 18 March 2018 was this version and not the newer version. Nearly impossible to sleep in this "cradle" seat due to awkward position when fully reclined. Prefer the aisle seats D and G as you have clear access to the aisles. Good service and food, no amenity kit. ANA is falling behind competitors on their regional business class. YVR - HND now flies this V.1 787 with no lie-flat business class seats. This is terrible for the money you pay. Business Class is terrible. The seats force you into a 'cradle-like' position. There is no foot rest. If you are over 5'5" tall, then you will be very uncomfortable. 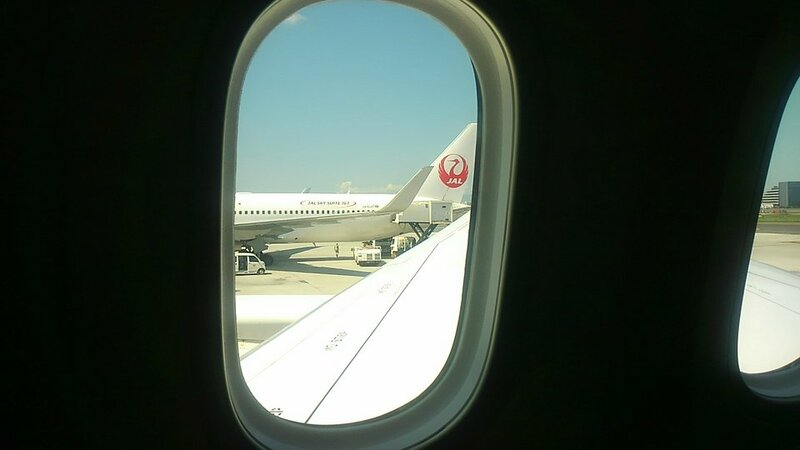 I was in 3G from SIN-HND and I hated every minute of the 7 hour flight. It is a lousy experience for Business Class and definitely not worth it. I will never fly business on an ANA flight that doesn't recline 180 degrees. Total waste of money. Just flew on a Tuesday NRT-BKK flight and was surprised that the two-class 787 used was config 3, so this comment really isn't about the 2-4-2 config but for the fliers who have been stuck with this config and its uncomfortable "shell" seats. Try to book this version. Config 3 with a 3-3-3 config would appear to be less comfortable in econ because of the extra seat, 9 across. But actually the seats are completely different from the "shell" type seats, and consequently much more comfortable. They recline with both seat bottom moving forward and seat back reclining backward. This more conventional arrangement does result in the seat in front reclining into the space behind. But believe me when I say this is far more desirable than sitting in those shell seats that are the worst I have ever experienced. Even the cushioning seemed much better to me. I believe these are the seats that United is using on their 787's. 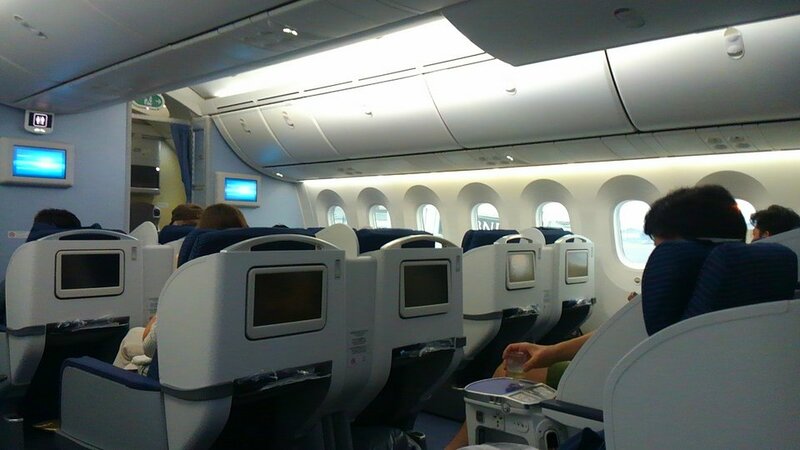 The seats don't seem narrower, though they may be, so ANA fits more seats into economy. Don't know where they got the extra space but the aisles could be narrower. Agree with the neg comments on ANA's 787 NRT-BKK. The econo seat is the worst design. In effect, the seat is a net loss in leg space for every econo passenger. The supposed recline one gets from sliding the seat bottom forward is negligible, because the upper seat back really doesn't do anything but a minimal pivot action. The fact the seat back doesn't recline into the space behind, is of some advantage in maintaining over all space, but not much for the legs and knees, if you want to try the simulated recline. As stated, they will be jammed into the stationary seat back ahead of you. Not an acceptable trade off for anyone over about 5'7" in height. You can avoid this config on this route by flying any day but Tuesday NRT-BKK, and Wednesday BKK-NRT. AVOID THIS ANA PLANE. Have not flown ANA's other 787 configs. I recently flew ANA dreamliner 2 class 787-7 from Singapore to Narita.Not sure I wrote the correct flt number as I don't have my boarding pass? I was excited to see the new plane. 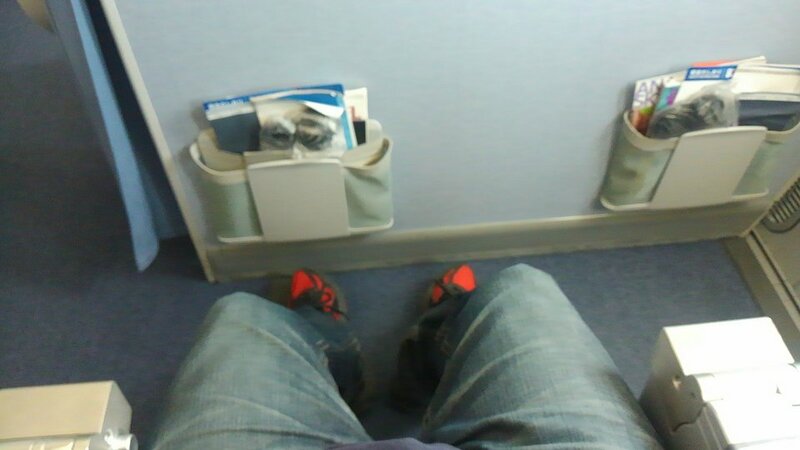 Well I am 6 foot 2 in and the business class seat was reclining one only. It is a horrible seat forma tall person The seat only had one button to push to change seat and it simultaneously raises the leg rest while recling. I could not recline fully because as the leg rest area went up, my feet were squashed into the seat in front of me. It was an agonizing 7 plus hour flt. I can"t begin to imagine if I had gone economy class!!! I have flown ANA 787s from Singapore to Haneda (and also Narita) many times now and feel I can critique the economy experience quite well (and compare it to the 777s of Singapore Airlines on the same route). Overall comfort on the ANA 787 is better than on 777 - more space for feet, (fewer boxes and seat supports and no metal leg rest to get in way if you are tall). The non-recline of seat may sound like an issue, but the better space for feet makes up for this (and not having seat in front recline into you). Still if you are tall make sure you get an aisle seat, it still will not be that much of a comfortable experience (!) but better overall than 777. ANA better than SQ on this route in economy because of the comfort of 787 and the cabins newer too (some of the SQ 777s have little cushioning left in the seats and are a bit tatty). If you want a quieter seat then pick one close to front of economy section as fewer people will be walking past/moving in the vicinity and it is away from toilets and galley (13c is a good option for this reason). Note that on the SIN-HND route it is the 787-8(788) Two Class V1 layout that is used. This was the most uncomfortable flight I have ever taken. I was so excited to fly on the 787 but the trip was completely ruined by the tortuous seat. As noted, there is no recline and the seat pitch is already extremely narrow. With my knees touching the seatback front, even trying to "slide forward" was out of the question. 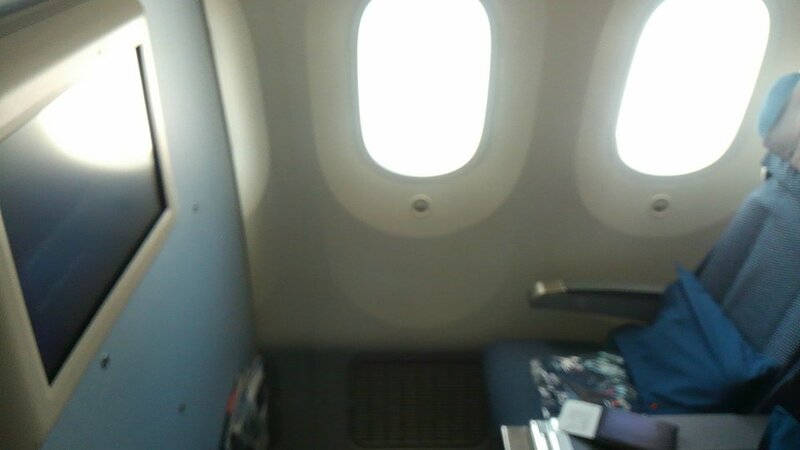 In addition, the seats are very tall and encased in plastic, so it makes for a very claustrophobic experience. The tray legs are very sharp and their positioning means that your knees are automatically forced into them. The very low hanging magazine pouch and lack of recline, make it near impossible, too, to try and seek relieve by stretching yours legs under the seat in front of you. It was near 7 hours of torture on my flight from Tokyo to Bangkok. The cradle seats are fine for a regional flight but for a seven-hour, overnight flight from SIN to HND they are completely unacceptable: very uncomfortable and totally unsuitable for a decent night's sleep. I have paid the extra and rebooked on the SQ code-share. My first experience on ANA and my last. I hate these seats. They don't actually recline, the seat moves forward and, apparently, simulates a recline. As soon as I start to 'recline' my knees hit the seat in front on me. The best I can do is to have my knees splayed to the edges of the seat back in front, infringing on neighbors and feeling very uncomfortable. This 'recline' feature is completely unusable. I found the lack of seat recline really annoying. Maybe Ive just gotten used to tilting the seat back over the years, but it felt like I was unable to get a nice recline going to enjoy this flight. 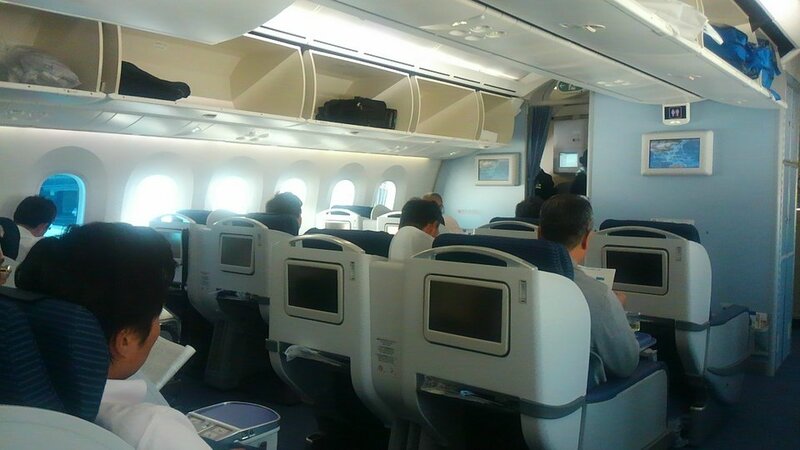 The TV system is limited also - not the full range of programming that UAL had for example on the 787. Food was good.